One of the best things about the H.R. Macmillan Space Centre, besides the wonderful things to do inside, is its location. It is right next door to the Vancouver Museum and just a short walk from the Maritime Museum. All three of these great family adventures are located in Vanier Park, a beautiful destination in its own right just on the edge of False Creek. The Space Centre offers voyages on a cosmic flight simulator. Fun for kids, but it’s best enjoyed before lunch rather than after. There are moon rocks, a real Apollo moon buggy, space suits, a simulated space shuttle and an International Space Station to explore. 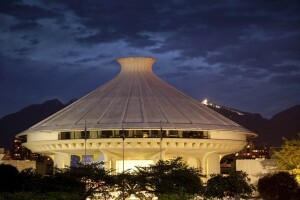 The Centre houses a Planetarium Theatre complete with astronomy presentations and laser light shows. The Vancouver Museum, just next door, besides its excellent programs and surprises for visitors that include magical mystery tours, Midnight in the City, free lectures, a story telling festival in November, and ongoing children’s entertainment. The Vancouver Maritime Museum, just a short walk from the museum is essentially a ship with a building built over it. The museum features the St. Roch, a famous Canadian ship that, in 1944, circumnavigated North America. When you visit the Maritime Museum, don’t overlook the little dock just next to it with its collection of boats, its small boat repair shop and great views of Vancouver across False Creek. On weekends, you can pick up a tiny ferry to Science World or Granville Island from the Maritime Museum dock.